Released on Wednesday, the Obama administration’s 2014 National Drug Control Strategy announces large-scale drug policy reform in response to an urgent crisis: Our 40-year War on Drugs has incarcerated so many people on non-violent drug charges that the U.S. has thehighest prison population in the world. The Strategy calls for immediate action: “Our prisons and jails are already overcrowded with people who desperately need compassionate, evidence-based treatment for the disease of addiction–not a jail cell.” Even the Strategy’s Twitter hashtag promises #DrugPolicyReform. Yet the gap between these words and Obama’s actions on drug policy is a mile wide. The Strategy is supposed to explain the administration’s funding priorities in the National Drug Control Budget. But in the 2015 budget, Obama calls for more money to be spent on drug law enforcement — from police to prisons to international drug interdiction — than any previous president. The Strategy fails to acknowledge this enormous gap between its words and its budget. It presumes that speaking out against out-of-control mass incarceration aligns perfectly with requesting a federal prison budget that is higher than any previous administration. 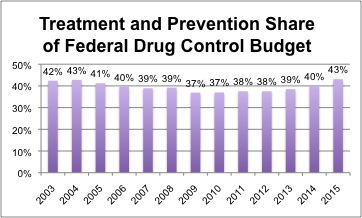 The Strategy argues that the 2015 budget is “Emphasizing Prevention over Incarceration,” because “the portion of the Nation’s drug budget spent on drug treatment and prevention efforts–43 percent–has grown to its highest level in over 12 years.” It sounds like great news: we are spending a record-high portion of our drug control money on treatment and prevention (T&P) as opposed to law enforcement. But the claim is a blatant misrepresentation. Table 3 in the 2015 Budget itself shows that our emphasis on T&P is not significantly different than it was twelve years ago (see figure). The striking gap between words and actions is not so much political hypocrisy as it is an important victory for the drug policy reform movement. Who would have guessed five years ago that today Obama’s anti-drug hashtag would be #DrugPolicyReform? When your opponents copy your rhetoric, they have surrendered to your values. There should be no mystery why the White House is talking the talk of reform. Over 80 percent of the American people support medical marijuana, including as of June 30 the Republican-controlled House of Representatives. Over 80 percent also believe that the War on Drugs has failed. 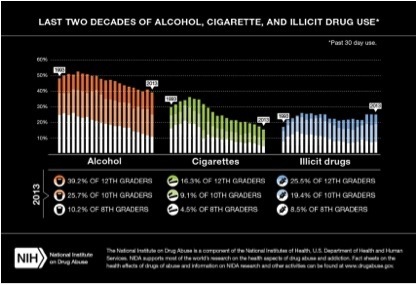 Americans know that high school kids have been using illegal drugs at the same rate for the last 20 years, while cigarette use has dropped by 50 percent (see figure). 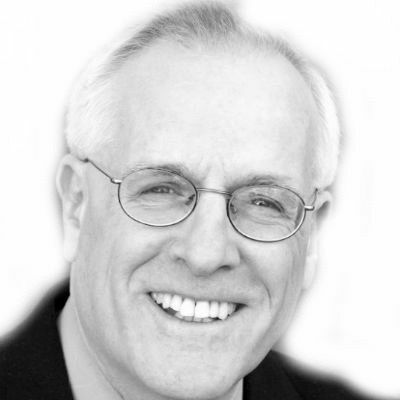 If we can reduce teenage drug use more effectively through regulation, taxation and cultural change than through prohibition, why are we shielding the street gangs and Mexican cartels from legal competitors in the $34 billion marijuana market? Why are we locking up world-record numbers of poor people for minor drug crimes to the point where an African-American male child born today has a one in three chance of going to prison? No wonder that the latest Gallup Poll shows that 58 percent of the American people support the legalization of recreational marijuana. Politicians typically shy away from anything that appears “soft on drugs,” but they have caught on to what the American people want: #DrugPolicyReform. If you live in Florida or Pennsylvania, find out about upcoming medical marijuana legislation: Amendment 2 in Florida and Senate Bill 1182 in Pennsylvania. Finally, and most importantly, talk about drug policy. Most likely, your friends, relatives, colleagues and random strangers agree with you. If they don’t already, they would appreciate knowing that drug prohibition has not only failed to reduce use but is also responsible for mass incarceration, gang violence, and a civil war in Mexico. Why not start a conversation with them about this issue and what steps you can take to advance drug policy reform? When the #DrugPolicyReform majority goes public, the White House will close the gap between its words and its actions. Add your voice today!